Hey folks, it’s time to whip out a fresh sheet of paper and start organizing your life. Better yet, use the Farm Folk / City Folk 2010 calendar. On the practical side I love the big squares for adding notes, but it’s the beautiful images of life on the farm from award-winning photographer Brian Harris that make me feel refreshed when the schedule gets jam-packed. There’s nothing quite like farming — or on my scale, community gardening — to reconnect with the earth as our food source. Oh, and don’t forget the delicious, monthly, local food recipes! Remembering and connecting to the the rhythm of nature is it’s own reward, but for those who want more it’s also good to know that all proceeds from the calendar go to supporting community initiatives at Farm Folk / City Folk. 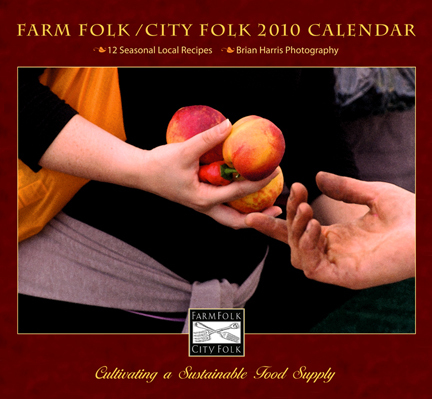 Note: You can find the Farm Folk / City Folk 2010 calendar at select retailers or order it online. Do the latter and tell them you heard about it here at LocalDelicious.com and you’ll also receive a pair of complimentary Farm Folk City Folk greeting cards. This entry was posted in General, Organizations and tagged community garden, Farm Folk City Folk, FarmFolk/CityFolk 2010 Calendar on January 11, 2010 by local delicious. The tomatoes are happily enjoying the heat wave and ripening at a delightful pace. The rhubarb, not so much (top middle of photo, completely wilted leaves). The marigolds never skipped a beat despite the mid-heatwave transplant — I think they’d survive a nuclear attack. This entry was posted in 16 Oaks Community Garden, Urban Gardening and tagged community garden, marigolds, rhubarb, tomatoes, Urban Gardening on August 2, 2009 by local delicious. Despite the fact that I had very poor results with seedlings the first time I tried, I find it impossible to do nothing while I’m waiting for the soil to be delivered at my new community garden plot. So, despite my better judgment, I have seeded some peas and beans again. At least it’s warm enough that I can put them outside to get them acclimatized before I plant them in the ground. The beans sprouted 6 inches in 1 day (you could almost see them growing!) 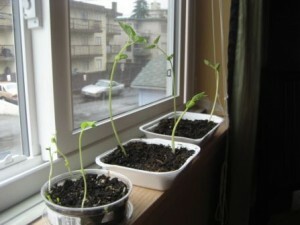 once I transferred them from the damp paper towel where I sprouted them into some starter soil. They look pretty happy overall. I hope that soil gets here soon! This entry was posted in 16 Oaks Community Garden, Urban Gardening and tagged community garden, Urban Gardening on July 2, 2009 by local delicious. I was down at the 16 Oaks Garden today, choosing my new community garden plot. I’ve been on the wait list pretty much since it opened (I was number 56 when I registered! ), but wasn’t quick enough to get in from the ground up. Turns out, that wasn’t such a bad thing. In the past couple of weeks, the garden coordinators have managed to get soil to fill in the crater that made much of the land area useless. Those of us coming in at this stage are getting great base soil, excellent drainage, brand new boxes, and a heap of luscious compost to get our gardens started. Granted, we’re starting late in the season and will be well behind many of the gardens that are already lush and green, but frankly, I’m just thrilled to have gotten a space. It’s not that easy to do in this city! It’s awesome to have a garden within walking distance of my home. I’ll be sharing my plot with a friend who also lives in a condo in the area and doesn’t have a yard. We’re already talking about the herbs and veggies we’ll plant once the beds are built (scheduled for tomorrow) and the compost is delivered (hopefully mid-week next). Basil, dill, green onions, spinach, lettuce, tomatoes…the list is growing. I’m interested to see how it compares to the non-raised bed output. 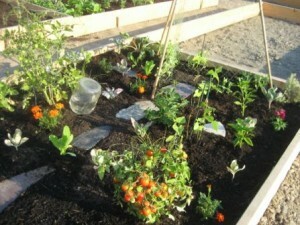 This entry was posted in 16 Oaks Community Garden, Urban Gardening and tagged community garden, Urban Gardening on June 27, 2009 by local delicious.